Can you please tell me how you got your phone to do this? I am a moderate internet user, have Juice Defender and Advanced Task Killer yet I can not seem to get my phone to last more than 3 maybe 4 hours. Also, in stand-by mode, my phone loses power rather quickly. I do not have 4g, wi-fi,bluetooth or even gps on to conserve battery yet the phone dies so often, I carry my charger with me everywhere I go. Marcus, you don’t need ATK, just follow the basics, see here. This doesn’t prove anything. 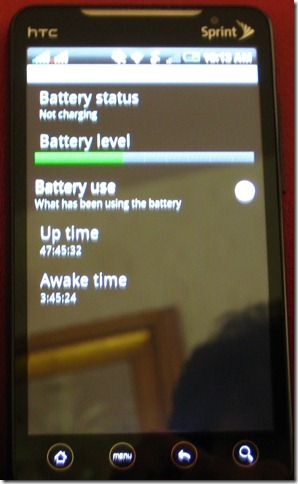 Uptime is the amount of time the phone has been up and running, including while it is being charged. My EVO is currently showing 85 hours of up time and 12 hours of awake time and I charged it last night. I’ve actually been on the battery for about 6 hours. You are right – you need to move to the next screen, by touching “Battery use”, then you get more details, and the top line will say something like: 47h 45m 32s since unplugged. But if you follow my link under “from 5 hours to 2 days standby time” above, you’ll see that I charge my EVO turned off, so for me uptime always = unplugged time. OK – It would have been good for you to show the Battery Use screen as well in your post to make this clear. I will try charging mine powered off tonight to see how much of a difference it makes. Not sure if you guys have experienced this but my battery life dies even when the phone is powered off.. and i mean completely off. why? I have full charge prior to shutting off my phone at night. i wake up in the morning and turn my phone back on and noticed that it’s got less than half battery life left.. what’s going on? Is there a good extra life battery for the Evo, and if so, what’s it called?